Day 3 of our holiday recipe phase features a nice winter corn chowder from Atina Diffley, author of Turn Here Sweet Corn. Day 2: Helene Henderson's Swedish Pancakes with Cranberries and Sweet Potatoes with Pomegranates. Day 1: Beth Dooley's Sweet Potato and Walnut Salad and Cranberry Snack Cake. Four generations of the Diffley family come together in August to freeze corn for winter eating. Here, Martin Diffley (left), his grandchildren Emma, Chase, and Blake, and daughter, Eliza, prepare to husk just-picked sweet corn. During the corn-growing season, Martin and I eat most of our sweet corn in the field uncooked and fresh. 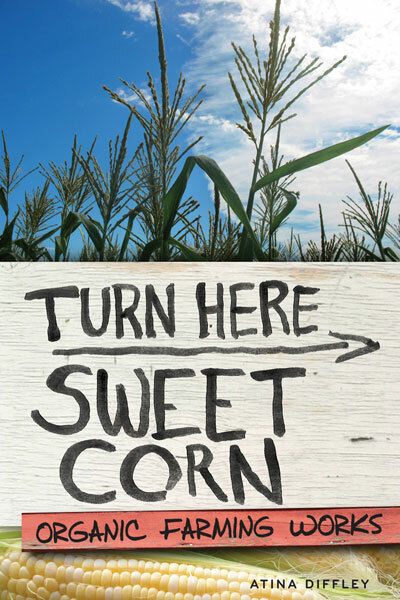 During the holiday season we use our frozen sweet corn to bring the stored sun and warmth into the short winter days. When I was a kid I was taught how to cook “farm-style,” which meant using whatever one has on hand, and knowing how to swap out ingredients because “you wouldn’t be having free time to just run into town to pick up something.” How did my childhood cooking mentors know I’d be so busy! To this day, recipes are simply starting places for me, and most ingredients (and amounts) are fair play for substitution. Feel free to adapt this recipe to use the ingredients you like to eat or that you have on hand. Heat the butter in a soup pot over medium heat. Add the onion, garlic, and thyme, and sauté about 3 minutes. Sprinkle the vegetables with the flour and stir it in. Add the broth and bring to a boil. Add the cream or milk and the potatoes, bring to a boil and simmer for about 10 minutes, until the potatoes start to break down. Add the sweet corn kernels. Season with salt and pepper and simmer until the corn is soft, about 5 minutes. Turn off heat, stir in the parsley and a dollop of olive oil. Garnish with chopped parsley. Atina Diffley is an organic vegetable farmer who now educates consumers, farmers, and policymakers about organic farming through the consulting business Organic Farming Works LLC, owned by her and her husband, Martin. From 1973 through 2007, the Diffleys owned and operated Gardens of Eagan, one of the first certified organic produce farms in the Midwest. She is author of the memoir Turn Here Sweet Corn: Organic Farming Works.